Monica Melissa Patterson walks in during jury selection in her capital murder trial at the Hidalgo Courthouse September 20, 2017 in Edinburg. EDINBURG — After days of witness testimony and grueling cross-examination focusing on the procedural aspects of banking practices, a courtroom fatigued by numbers suddenly came alive Thursday when defense attorney O. Rene Flores dealt a blow to the prosecution’s capital murder case against Monica Melissa Patterson. In the last hour before District Judge Noe Gonzalez dismissed the jury on the fourth day of a trial expected to last at least three weeks, Flores argued that there was no evidence linking Patterson, 50, to the January 2015 death of Martin Knell Sr.
“We can sum up your testimony by suggesting to the ladies and gentlemen of the jury that you have no evidence that Mrs. Patterson committed any crime?” Flores asked Sandra Rangel, a crime scene investigator for the Hidalgo County Sheriff’s Office. 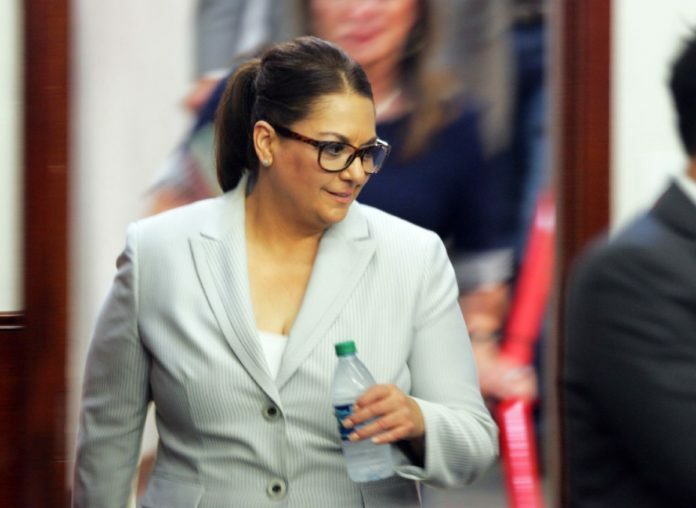 Her testimony came after previously being asked by the prosecution to explain numerous photos taken of Patterson’s Comfort House offices and Harlingen residence, as well as the 96-year-old victim’s home and safe deposit bank at Chase Bank. After Patterson’s August 2015 arrest, the sheriff’s office, along with the Texas Rangers, executed search warrants of these four locations over the course of that month and September of the same year. They investigated the charges against Patterson, which in addition to capital murder include two counts of theft and misapplication of a fiduciary. Despite the curious nature of the evidence Rangel and fellow investigators documented and collected from the safe deposit box, she told Flores there was “no evidence that Mrs. Patterson took any money” from the box. Patterson’s fingerprints were not found on the items, which included documents, a coin collection and most notably, bundles of bills that, when counted, did not add up to the amount listed on the currency strap. Investigators, Rangel told the prosecution, discovered that $44,485 was missing from the $235,000 that was supposed to be in the box. Three of the six bundles of cash were found to have $1 and $10 bills mixed in with the $100 bills. While the correct number of bills was in the bundle, it did not add up to the amount listed. Max Grubb, the McAllen pastor who testified Tuesday, and Comfort House, were named on two of the bundles, each amounting to $100,000 and both of which were missing money. After Flores’ quick cross-examination of Rangel, Assistant Criminal District Attorney Joseph Orendain questioned her on the lack of Patterson’s DNA evidence on Knell’s kitchen chair and tables, and Rangel said it did not rule out the potential for the defendant to have been in the house. Orendain also pointed that anyone with a key to the house could have entered it from Jan. 28 to Aug. 26, 2015, the period between the death and subsequent investigation. Flores also used his brief cross-examination to question whether the sheriff’s office and the Texas Rangers had treated the investigation as a homicide before conducting an autopsy of Knell’s body, and why investigators had never treated Knell’s housekeeper as a suspect. Orendain promised jurors in his opening statement on Monday that they will hear testimony from the housekeeper, as she was the one person who allegedly was witness to the events leading up to Knell’s death, which the autopsy ruled was a result of asphyxiation. Another curious item revealed to the jury was a letter allegedly written by Knell on Dec. 15, 2015 stating that Francisco Perez, a former employee with Greater Valley Hospice Alliance had visited Knell at his house four days earlier, something Perez vehemently denied. The prosecution showed the jury Perez’s activity log from Dec. 11, 2014, that did not list such a visit. The full-page letter that was typed up on a computer — and mentions an “uncomfortable internal family dispute” and a “dysfunctional relationship between my son and I” — has Knell’s signature, but no return address. It goes on to charge Perez with questioning Knell about his personal finances; Perez remained composed in saying he never visited patients because he was as a marketer for the alliance. During Thursday’s trial, Mission Mayor Norberto “Beto” Salinas made an appearance in the courtroom to watch the proceedings. His son is Ricardo “Rick” Salinas, one of Patterson’s four attorneys. Another notable appearance included District Court Judge Israel Ramon Jr., who also briefly sat in the gallery to watch the proceedings. This story was updated to reflect the correct dates of Francisco Perez’s activity log and a letter that was allegedly written by Martin Knell Sr.